You will need to buy a plain mug. I bought white mugs, but I am sure that any colour would work, as long as your Sharpie colour contrasts with the mug colour. You will also need oil-based Sharpie paint pen. (Not a regular Sharpie.) I found mine at Michael's. 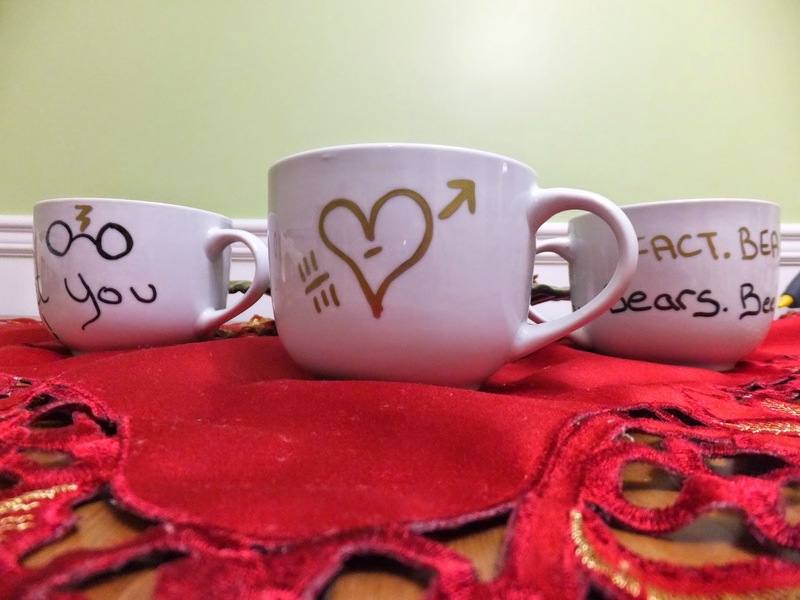 Step #1: Draw your design or write your message on the mug. Step#2: Allow the mug to cure for 48 hours. Step #3: This is a step that I skipped for now. I won't be putting mugs in the dishwasher and I read that if you let the mugs cure for 48 hours they will hold up just fine. Many people suggested baking the mugs to set the design. Apparently, this will make your mugs stand the use of the dishwasher. Place the mugs into a COLD oven. Set your temperature to 450 degrees fahrenheit. Allow the mugs to "preheat" along with the oven and then bake for 45 minutes. When the mugs are baked, turn the oven off. Let the mugs cool down inside the oven. After the mugs and oven are completely cooled, remove the mugs. The mugs were fun to make. If I were to do it again, I would fit the quote on one "side" of the mug. I wrapped my quotes around and I don't love the effect! I would also take more time planning my mugs and executing the plan. I was "winging it" and I think it shows! I know Hubby will get a kick out of his mug and it was a fun craft to try. I would definitely do it again! Have you done the Sharpie mugs? What worked best for you?